L’Occitane has launched Herbae, a new fragrance for women. 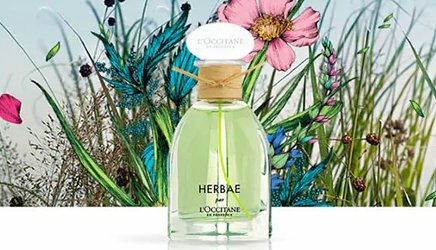 Based on, and inspired by the wild grasses that grow in the heart of Provence, HERBAE par L’OCCITANE is a green, fresh and floral fragrance. It's the emobidment [sic] of nature in all its authenticity and simplicity. Additional notes include ambrette seed, white nettle flower accord and clary sage. L'Occitane Herbae is available in 10, 50 and 90 ml Eau de Parfum and in matching bath & body products. That background picture looks so pretty and the bottle itself looks quite nice as well. It is a nice bottle! I love herbal scents, I can’t wait to try it! I liked some of their very old scents…but have not liked many of them lately. Robin, this bottle is even nicer looking than yesterday’s green one! Also, there is a typo in the first paragraph with the word “embodiment”. Thank you so much Jalapeno … did not even notice it! I was lucky the other day because this Baptist Church put a sign out they were having a free market. We went just to look around and since I am six months pregnant with my first child (a girl!!) every church lady was so nice and literally all over me. One of them handed me a christmas-wrapped gift box and said they are cosmetics inside from a friend of hers but she does NOT use anything but Nivea cream so I should have it, brand new, unopened etc. I felt like opening my own christmas gift!! Inside was a couple of L’occitane solid perfumes and a box of L’occitane Amande Supple Skin oil. Out of curiosity I googled it and it cost $50.00 bucks alone! I tried this oil that is suppost to be great for all Your skin… and it is! I love this stuff now and instead of using a regular body lotion I will put this after my showers! Very mild but deliscious fragrance of this oil. Perfect for me to just put a dab of an almond fragrance with it! I’m so happy. I do like l’occitane’s stuff so I am like real happy! 😊 a good freebie! That’s the best, glad you enjoy it & congratulations! “Its musky facets are enhanced by a touch of musk…” Sold! But the flacon does look pretty and herbal sounds good. Re typical fade-to-Glade of most of L’Occitane’s scents, the body milk and hand creams are warmer, e.g. Néroli & Orchidée and Fleur d’Or & Acacia.